I downloaded this novel free from Amazon because I was looking for a lighthearted paranormal romance to distract me. I assumed it was along the same vein as other paranormal romances I have made like Karen Chance’s Cassandra Palmer Series or Patricia Brigg’s Mercy Thompson series. I wasn’t too far off. My favorite part of this book had to be the diversity of characters. Each character had their own personality, that it felt like you were reading about real people instead of caricatures. It seemed to come naturally too. There were no page long paragraphs tediously describing each character. You picked up bits and pieces along the way. The world and story that Chase created were also pretty interesting. I am partial to ghost stories, which is what drew me to the book in the first place, so that whole aspect and how they dealt with the ghost was fantastic. The rest of the Chase’s mythology, however, is what was really interesting. After looking at future novels in the series, however, I feel that the series will become way to complicated and in depth for me. I also don’t enjoy reading about angels v. demons. The novel has a couple twists. The one concerning the ghost didn’t feel like a twist to me. I figured it out much earlier in the novel so when it was confirmed I really didn’t even notice. The secret surrounding Kane, however, was pretty surprising. I wasn’t expecting it even though I knew he had a secret. All in all, Haunted on Bourbon Street is a well-rounded novel with engaging characters, an interesting world, and plot that keeps you reading til the very end. I cannot think of a single thing I didn’t like about the novel. I am not sure I will read the rest of the series, however, after reading the synopsizes and seeing where the story is headed. If you are looking for an enjoyable quick read, I highly recommend downloading it, especially since it’s currently free! Have you ever had a book completely surprise you? 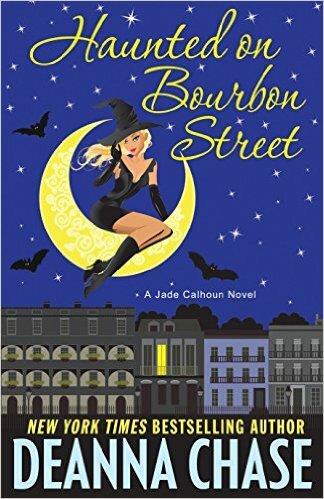 This entry was posted in Books, Reviews and tagged book review, Books, deanna chase, haunted on bourbon street, jade calhoun, paranormal romance, reading, romance, series. Bookmark the permalink.